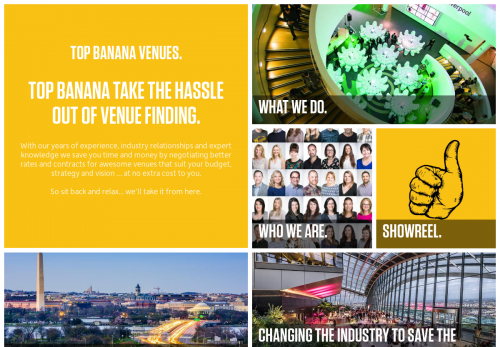 TOP BANANA TAKE THE HASSLE OUT OF VENUE FINDING. With our years of experience, industry relationships and expert knowledge we save you time and money by negotiating better rates and contracts for awesome venues that suit your budget, strategy and vision … at no extra cost to you. So sit back and relax... we’ll take it from here. CHANGING THE INDUSTRY TO SAVE THE PLANET.